This wonderful straw hat has a front brim that is tipped back in the center. The sides of the hat hug the face. The front of the crown may be decorated with a looped ribbon, flowers and feathers. The inside of the brim may be decorated with pleated velvet or satin that coordinates with the costume. 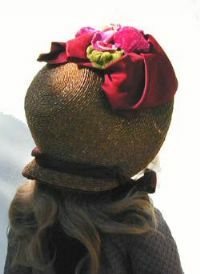 A ribbon may be twisted and placed along the back brim, attached on each side and continuing on to form the ties for the hat. 026 - Head circumference of approximately 12 -13 inches. Requires approximately 20 yards of 1/4 inch hat braid sold separately or as part of a kit. 026A - Head circumference of approximately 11 -11.5 inches. Requires approximately 16 yards of 1/4 inch hat braid sold separately or as part of a kit. 026UF - French Fashion heads of approximately 5 inches. Requires approximately 7 yds of 1/4" braid sold separately or as part of a kit.